I know it has been quite some time since I posted a review. I hope to start posting regularly. I've spent a large portion of time in the last week or two reading and writing reviews. I just didn't get them posted. So I am going to start off with two wonderful books by Max Elliot Anderson. Max Anderson has written a wonderful series called the Sam Cooper Mystery Series. 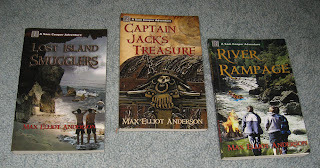 I read and reviewed the first book Lost Island Smugglers in July of 2010. You can find it here. I will be reviewing books number two and three today. Tomorrow I will have a review of two of his other books. So sit back and get ready for reviews of two great books. Sam, Tony and Tyler are best friends. They are constantly looking for adventure. Sam receives a metal detector from his dad for his birthday. He and his friends have heard that people have found a lot of treasure in the area where they live. They do some research and figure that they can be the ones to find the next great treasure. If the mention of finding treasure doesn’t peak your interest then let’s throw in an old sea captain. We all know that boys, and girls, like stories about treasures and old sea captains. This particular sea captain appears to be hiding something. He hires the boys to help him rebuild his ship. Along the way the captain teaches them about true treasures. This is a book that both boys and girls, and parents will enjoy. I love the gentle message of laying up treasures in Heaven. All of Max’s books have a Christian theme to them. The reason I really like them is that I can put them on my shelves at school. I put them there not only for the Christian students, but also for ALL students. They are clean cut with great messages. They have adventures and mysteries to carry the reader from the first sentence to the end of the book. I would say it is a must read. In this book we meet Tony’s uncle. Tony is one of Sam’s best friends. Tony’s uncle is a white water river guide. He invites Tony’s friends to go rafting with him. He talks to their parents, assuring them he will keep the boys safe. Their raft will be tied to his. This sounds safe enough so they consent. The second day out on the river things go horribly wrong. The rope breaks tethering them to the guide raft. They get left behind. They make it to land and find an old miner. The old miner has some claim jumpers trying to take his claim from him. The boys jump in to try to help him. Things go from bad to worse. Read the book to find out if they make their way out. Find out what true courage is and how prayer can help in any situation. Once again this was a book that I couldn’t put down. Max Anderson’s writing style is simple enough for reluctant readers and has all of the elements of mystery and adventure that will grab them and hold them until the end of the book. I am looking forward to the next book in the series This Property is Condemned. It is due out some time next year. Go to Max's website and check out everything he has to offer. Just because it says Books and Boys it doesn't mean it is not for girls. My female students love these books as much as the boys. Max Anderson was a reluctant reader and he knows what will hook them. So what are you waiting for? Check the website and his books out.